If this doesn't make a stressful day better, I don't know what does. don't stress!! 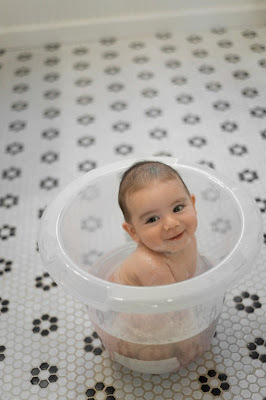 ...and those Tummy Tub Baby Bucket Baths totally rock!!! Oh my gosh SO adorable! So, so funny - my girlfriend just sent me a picture that she took of her little girl in a bucket - totally made me smile! This makes me want a baby!!!!!! Hahhaha I'm dying! Too cute! I agree! Super cute. Couldn't resist. Thanks for the post! BAHAHHA!!!! a hahahah !!! this is making me smile GIGANTICALLY!